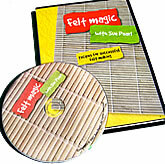 A well-crafted DVD on felt making, with simple to follow instructions. This DVD will take you through the process of making felt step by step showing you how to make a piece of flat felt, needle and pre-felt and how to create lovely pictures and original art. It also shows you how to make felt beads and then goes on to show how to make three-dimensional felt. It has all the information you will need on how to get started in feltmaking and gives a background to the ancient craft as well as explaining all about the materials and tools that you will need.